"The Sound Of The King-Size Beat!" ...here you behold a 1950 Gates "More Watts For Your Dollar" package console capable of real lo-fidelity reproduction. And by the time we had made its acquaintance, its performance was even less impressive. Remember with us now the daily farm reports, "rip ' n read" news and weather from the UPI clacker next to the stairwell. 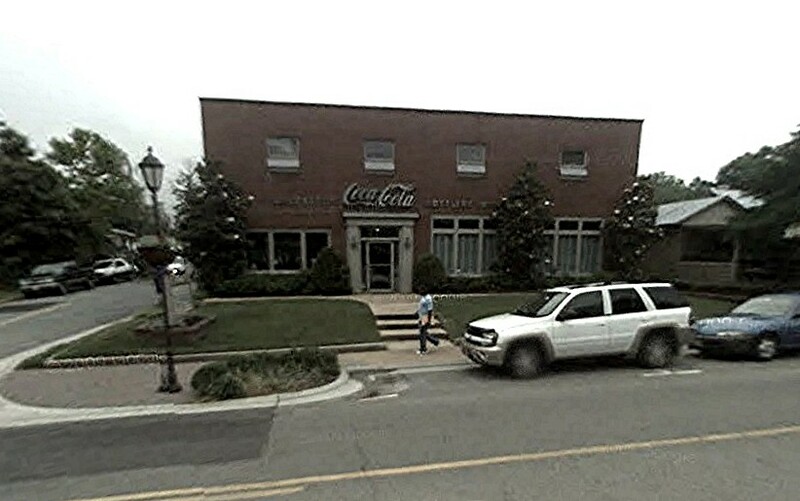 The loud rumble of the Coca-Cola trucks downstairs outside the open window waiting to get on Main Street while you were in the midst of delivering said news and weather reports. The "jackpot" remote control that had to be clicked and reset repeatedly before it'd give up a reading which needed to be done every 30 minutes. "Tidewater Travels with Woody" and its plodding theme "Paris Mist" by Ted Heath, the theologic "Morning Devotions" which was an excellent opportunity for a smoke break, the Thursday morning "Urbanna Hour", which in reality was only 30 minutes between 9:30 and ten and utilized a very well worn and scuffed copy of "Twelfth Street Rag" by Pee Wee Hunt as its jazzy theme... Virginia Network News at the bottom of the hour, Baltimore Orioles baseball, "Here's To Veterans" and "Hometalk" with Fred Gwynne and Betsy Palmer on ET. The pleasure of getting a Coke for a dime and never having to cash your own paycheck, that was WOODY radio! 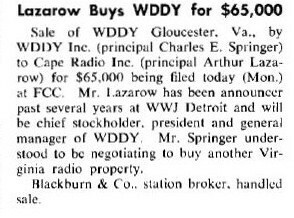 JACKSONDOUGLAS was the last operator hired by Cape Radio Inc., licensee of WDDY Gloucester until June 1981. 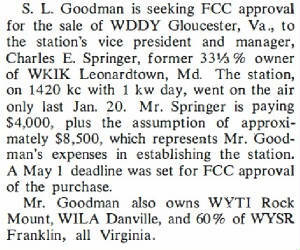 At that time the property was bought by Mr. Robinson the "Happy" radio guy formally from WHAP Hopewell VA and his money man, Mr. Eure who took this example of mid-century radio artistry and turned it into a run-of-the-mill everyday boring example of radio huckstry, using it to promote FM at the AM's expense, also decreasing its power by 25%. "WOODY" Radio is no more. at last report the calls are residing at the 1460 spot in Albany New York owned and promulgating the Disney form of program. Its Chief Engineer and airtalent who left us for a larger audience in 1989. We're sure the cosmos is being constantly amused and enriched by his presence. Thanks for everything, Charlie! A great friend and airtalent who served as music director and gave the statistics of the daily pork slaughter at 1pm. 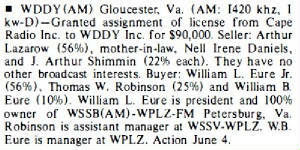 Winner of the prestigious "Dead Pig Radio Award" in 1981, at last report living the good life in Baltimore. We wish him the best and hope someday to meet again. Continuity director, airtalent and sometime host of "Tidewater Travels with Woody", We recognize her good taste in agreeing to sign us on when we dropped in to waste some time in June 1980. We've heard that she is well and keeping busy about Hampton Roads. To Susan, we express our thanks! Known as "Shad Roe", we had many interesting conversations with him back in the old days and we're glad he's around and hope he still enjoys Firesign Theatre. Thanks for checking in, Art! Host of "Tidewater Travels with Woody" and numerous remotes from area businesses. 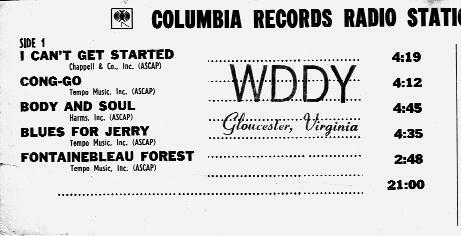 Bought WDDY in 1958. Prominent in the area Lions clubs and flew around a lot. A fair fellow and an economical broadcaster. We thank him for holding on to the station long enough for us to get in and experience the magic for ourselves. We'll always regard it a mistake for him to have sold it, however. Godspeed, John Glenn! 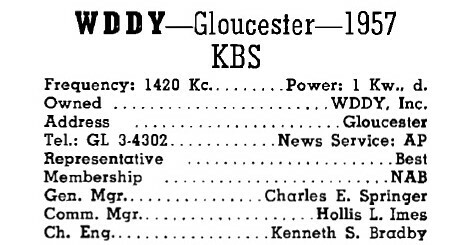 "WOODY" RADIO was something out of the ordinary. The likes of it will never hit the air again. 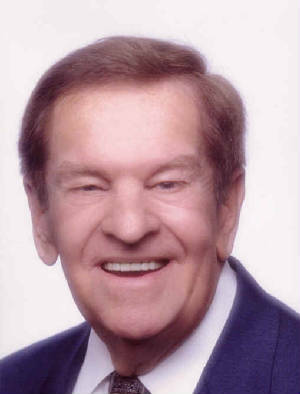 Share your memories of "WOODY" Radio with us. "Oh yes, the owl is wise, he blinks his eyes! Thanks so much for the memories. I never thought I’d hear those jingles again. 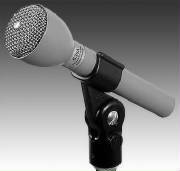 I grew up in Newport News, and as a kid, I thought I wanted to get in to radio. 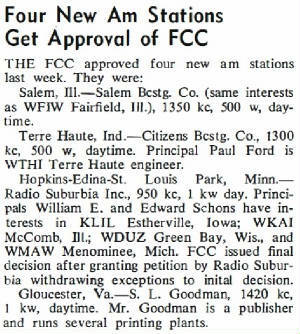 I thought it would be such a kick to broadcast on WoodyRadio. I wanted to give away that six-pack of Coke. No one in Tidewater did sports in the morning like WoodyRadio. 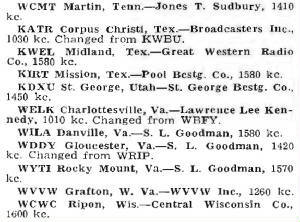 And even though we had the big boys, WGH and WNOR, I used to tune in every day to 1420 at 4PM to hear the top 40 with the scratchy sound at the beginning of most records. Again, thanks for the fond memories." "John O'Donnell here. 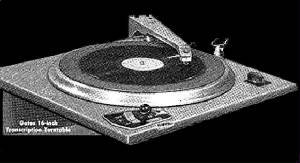 I was a disc jockey in 1960 at WDDY. I worked there from June 1960 until December 1960. 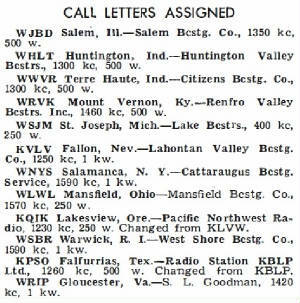 I later worked at WSLB in Ogdesnburg, N.Y. (1961-67). 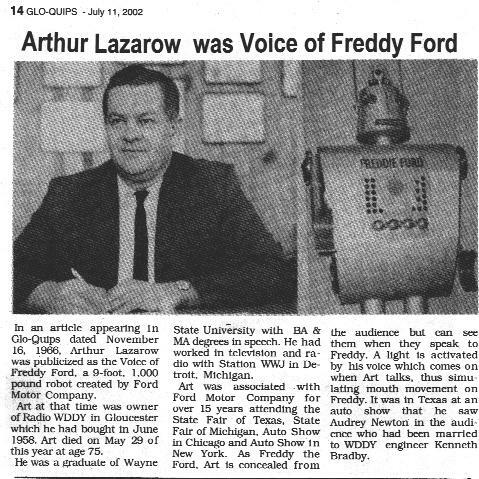 I was a graduate (1960) of Leland Powers School of Radio, Television and Theater. I switched professions in 1967. I actually was working as a part-time stringer for the Syracuse Post Standard and Herald Journal. beginning in 1965 until 1971. In January 1972 I became sports editor of the Watertown (NY) Daily Times until retiring in 1999. I still work on a part-time basis at the Times. I remember Art and his wife. They were great people. "